Few things get my attention as quickly as a come-from-behind award win by a new or not widely known author. 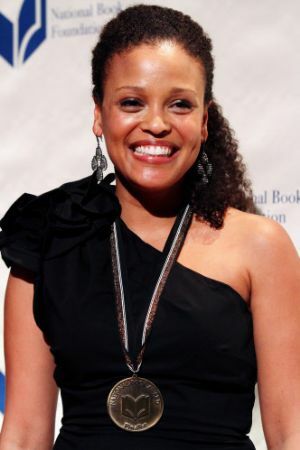 And the 2011 National Book Award was won by a come-from-behind, not widely known author: Jesmyn Ward, author of the previous novel Where the Line Bleeds. Ward is assistant professor of Creative Writing at the University of South Alabama. For 2010 – 2011 she was the John and Renée Grisham Writer in Residence at the University of Mississippi. From 2008 – 2010 she had a Stegner Fellowship at Stanford University. Need I say it? She is a writer of exceptional talent and potential. And – Hello World! – now everyone knows it. "Makes my bones hurt," Daddy said. "I can feel them coming." "Maybe you need to help her [China] push," I [Esch] say. Sometime I think that is what killed Mama. I can see her, chin to chest, straining to push Junior out, and Junior snagging on her insides, grabbing hold of what he caught on to try to stay inside her, but instead he pulled it out with him when he was born." The Batistes are a close family whose love and loyalty to one another are central to the story, stronger than the Job-like challenges they face and stare down. The father is an alcoholic who sometimes flies into drunken rages – mostly taken out on his son Skeetah – but even that doesn't diminish their cohesive family unit. They are as attuned to one another as their father to the oncoming storm, as China the pit bull to her owner, Skeetah. Their love, unconditional. As the oppressive heat pushed ahead of Katrina bears down on them, Esch, Skeetah and their father face the personal trials of their lives. Esch – filled with the story of Medea she's been reading – is trying to conceal her pregnancy from her family, while dreaming the father of the child will love her as she loves him. Skeetah fights for the survival of first China's puppies and then China, the two as intertwined as lovers. And their father, a widower fighting to raise his family alone, goes from strong family leader to an injured, helpless man reliant on his children to take on his role for the protection of them all. The layers in this story could be analyzed, the references to mythology traced, but frankly how many readers really want to? Never mind all that; leave it to the professors to note the themes of love, water, blood and violence and tie them up neatly. The story is urgent. The characters burrow themselves under your skin. Then comes Katrina, the off-stage character waiting three quarters of the book to make her appearance. Teeth bared and sharpened, She furiously slams down Her fist as they huddle together, realizing with growing horror She is no Camille. The final quarter of the novel is a nerve-wracking race to the finish, life vs. death, Katrina the god orchestrating the maelstrom. The water rises, the wind howls and ultimately it's up to Skeetah – most clairvoyant of them all – to make the decision that will save or undo them. "It is terrible. It is the flailing wing that lashes like an extension cord used as a beating belt. It is the rain, which stings like stones, which drives into our eyes and bids them shut. It is the water, swirling and gathering and spreading on all sides, brown with an undercurrent of red to it, the clay of the Pit like a cut that won't stop leaking. It is the remains of the yard, the refrigerators and lawn mowers and the RV and mattresses, floating like a fleet. It is trees and branching breaking, popping like Black Cat firecrackers in an endless crackle of explosions, over and over and again and again. It is us huddling together on the roof, shaking against the plastic. It is everywhere. Daddy kneels behind us, tries to gather all of us to him. Skeetah hugs China, and she howls. Daddy's truck careens slowly in the yard." So much talent in such a young writer. So much to look forward to. 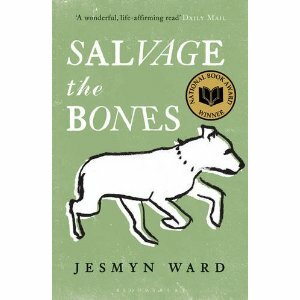 At the ripe old age of 35, Jesmyn Ward is at work on a memoir. Let's hope she has another novel in mind, too. In progress would be better. Finished? I don't dare dream. So nervous about reading this one. The subject matter is gonna kill me, but from what I can tell, it’s worth it. It’s so, SO worth it. It’s now on my list of all-time favorites. Fabulous review. I really must read this. I started Zeitoun last summer, but got sidetracked and never finished. It’s also about Hurricane Katrina and very well-written. Looking forward to reading this one by Ward. Les, Zeitoun is on my shortlist for this year. I’ve heard nothing but great things about it. Difficult to imagine there exists someone who possesses so much talent but also gets to be drop-dead absolutely over-the-top gorgeous! Goodness! Life is not fair at all! Tell me about it! Sigh. Wow. Fantastic review. I can’t wait to read this one!